“International Education Week affirms the critical role international education plays at Maryville University as well as our efforts to be a diverse and inclusive community,” says Esra Uysal, life coach and coordinator of the week-long observation. Mitt Patel, a first-year game design major, looks forward to the weeklong celebration. Campus activities began Monday, Nov. 12, with Taste of Nations in Gander Dining Hall. 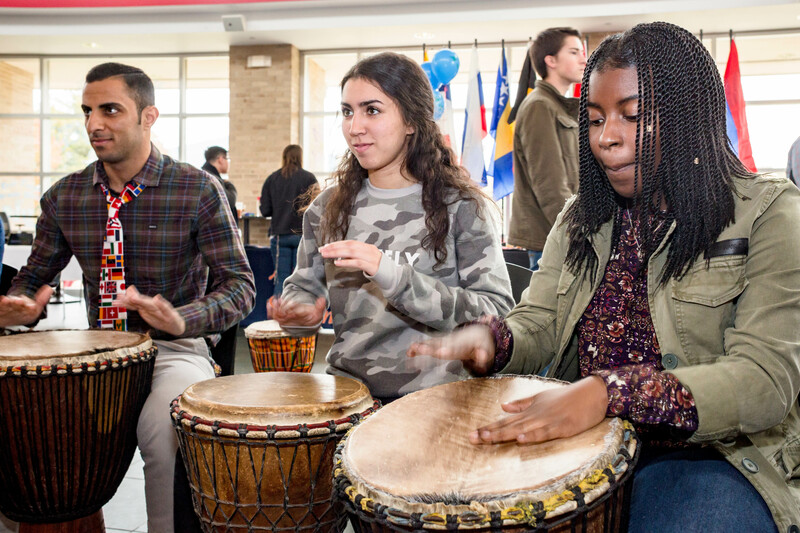 They continue on Tuesday, Nov. 13, with Festival of Nations—an annual favorite—which will be held 11 am to 1 pm in Donius University Center. The event features cuisine, crafts and music from around the world. Participants may join in an African drum circle and international music performances. Other highlights include a Lunch and Learn with a panel of Maryville multicultural scholars, who will speak on the topic “Immigration / Shed Walls, Destroy Barriers,” from 11:30 am to 1 pm on Friday, Nov. 16, in Buder Commons. Participants around the country will use the hashtag #IEW2018 to share their activities. International Education Week is a joint initiative of the U.S. Department of State and the U.S. Department of Education to promote programs that prepare Americans for a global environment and attract future leaders from abroad to study, learn and share experiences.